Since 2003, our residential and commercial clients have trusted our fencing company, Freedom Fence, for the highest quality ornamental fencing in Morris County NJ and nearby communities. If you have always admired the Old World style and elegance of wrought iron fencing, but have shied away from their expense, as well as the sanding and painting involved in maintaining them, then we have the solution. At Freedom Fence, our ornamental aluminum fences look similar to wrought iron fences, but they are not as expensive and are maintenance free. In fact, Freedom Fence provides a lifetime warranty that our aluminum fences will not chip, crack, fade, or rust. For a free estimate for ornamental aluminum fencing or our other fencing services in Passaic County NJ, contact our team at Freedom Fence today! Our aluminum fences also offer childproof self‐closing gates, which makes them an attractive and functional option for pool enclosures. When we install aluminum fencing, we securely set all posts in concrete. 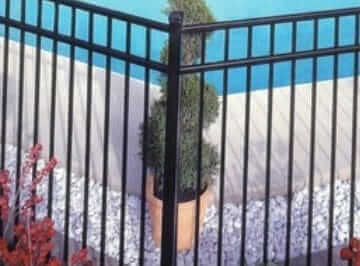 For assistance in designing your custom ornamental fencing in Bergen County NJ, call Freedom Fence at (973) 694‐7707 to speak to a member of our team today! Aluminum fence — is it right for you?